What got you involved with the HCG Diet? My sister, Linda read about Simeons’ protocol and her and my chiropractor brother tried the diet first. I thought they were crazy, doing INJECTIONS! They were very successful, she lost 20 lbs and he lost about 35 lbs in about a month. Then my mother, sister-in-law, and various other family members were all losing weight. I couldn’t be the only fat one in the family….so I started on my 46th birthday, one month after Linda Prinster and Rod started. What made you decide to make your HCG cookbooks? 101 Worry-Free HCG Diet Recipes - Linda and I were coaching people on Simeons’ protocol and our clients were bored with their daily menus and needed help being creative with what they could eat. We would type up recipes and make copies to help them. Essentially, it was the clients’ idea, in a roundabout way, that we make a formal recipe book. It was a necessary tool to help us help them. Over 201 Worry-Free HCG Maintenance Recipes – Well, if people had a hard time figuring out what to eat on Phase 2, with 8 meats, 4 fruits, and 13 vegetables, figuring out what to eat on Phase 3 with hundreds of possibilities was really difficult! Losing the weight is one awesome accomplishment but keeping it off is one awesome feat and our clients needed help to know what they could eat. They needed help moving to the ‘rest of your life’ phase. We tried to provide recipes that were appealing, nutritional, good tasting, and that could be eaten without causing weight gain. People needed help converting their old bad habits into new good habits. After losing weight, life goes on. People still go to parties and bring appetizers. They make deserts for their family and invite friends over for a few drinks. We wanted to empower people to do these same things but with recipes that would help them maintain their weight loss. How did you come up with so many great, creative HCG recipes? 101 Worry-Free HCG Diet Recipes - We went thru the list of allowable foods on the protocol and split it in half. After we, Linda and I, each went to the grocery store to purchase our half of the list, we met at Linda’s house with food and the recipes we’d already been using. We also had all flavors of stevia and as many pure spices as we had in our cabinet. Then we started cooking, tasting, arranging on plates and taking pictures. My two teen daughters took notes and away we went! Over 201 Worry-Free HCG Maintenance Recipes – First, we along with Pounds and Inches Away (PAIA) employees scoured through our recipe boxes. We were all experienced dieters and all had our favorite Maintenance-friendly recipes. Then we went to the internet and looked for recipes that sounded good, nutritional, and tasty and we converted them into low-carb, low-fat, low-sugar versions. Employees made the recipes and brought the food to work. Lunch was provided every day for at least a month to the employees at PAIA. While we ate, we raved and reviewed! 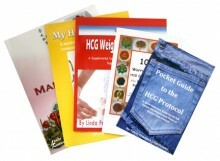 What do you think people will get from using your HCG books? Human beings need variety because when we get bored, we do things we don’t really want to do, like deviate from a weight loss plan. I hope our books help people to be more creative in preparing good tasting meals. In turn, these meals will be more satisfying so that deviation doesn’t come to mind. The books then will ultimately help people to follow the protocol more closely and to lose the most weight possible. What HCG advice do you have for people on the HCG Diet? If this is your first round of the HCG Protocol, congratulations! You have found the most effective method of weight loss I know about. In this modern age, we want everything fast, and this is fast. Keep in mind that you can do anything for about a month. At the end of 30 days, you’ll be amazed at the transformation. If you’ve done the HCG Protocol before, don’t take this protocol for granted. I’ve seen people who searched and searched for something that works as far as weight loss, with no success. Then they find the protocol and are wildly successful their first round. Their 2nd round, they fritter away, knowing that they have something that works…back there…on the shelf for when they get serious again. Do not fall into this pattern. Use the HCG Protocol to the fullest and be grateful that you’ve found it.